I recently updated my job search status to "Not interested in jobs." We haven't heard from you in a while, so we changed your status from actively looking to open, but not actively looking. You'll now receive fewer matches. However, my job search status before I got the email was "Not interested in jobs," and it remained so after I received the email (i.e. my status wasn't updated like the email claimed). I'm confused about why I got this email in the first place and why no changes were made to my status (like the email claimed). Why did I receive the email? Also, why am I still seeing ads for jobs even though I set my status to "Not interested in jobs?" 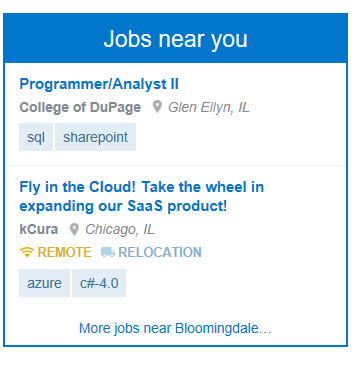 Is there a way to stop seeing the ads (given my lack of interest in new jobs)? (I'm planning on staying with my new employer long term). It looks like you had an account merge on Stack Overflow about 6 weeks ago and you had a lingering account that wasn't cleaned up properly. This is an artifact of how /jobs currently works (it's currently doing some crazy proxying through SO to another site since we migrated over from Careers 18 months ago)... I've merged the two accounts (your current account had an @gmail.com address, the previous one had an @comcast.net address) and you won't receive any additional emails unless you set your status to active again. Regarding ads; they show irrespective of your job search status. Not the answer you're looking for? Browse other questions tagged support status-completed jobs email job-status . How to set my job search status to not open? Why am I being emailed random jobs?